The band Ivan & Alyosha belongs to the genre of indie-folk-pop-rock (is that even a genre? if so, it is my favourite one). Their name does not stem from the names of the actual band members but from two characters in Dostoevsky’s great novel, “The Brothers Karamazov.” This alone makes the band super cool and worth a listen (I hope you didn’t read that with sarcasm, because I intend it to be fully serious, in accordance with my personal definition of “cool”). In my opinion, there is a lot to like about Ivan & Alyosha (even aside from their awesome name). Their melodies are eminently enjoyable and the lead singer’s voice has a distinct, almost ethereal quality to it that makes the music memorable. Yet there is something more too, to do with the lyrics and an intangible quality of the music. There is a profound struggle and seeking involved in their songs, a beauty expressed not by skimming a shallow surface but by dipping deep into the well of the human mind and soul. If you are a Survivor fan, then you probably already know that the new season premieres tonight at 8 on CBS. If, on the other hand, Survivor is only something you have heard about vaguely or seen the odd time on TV, then perhaps you are feeling surprised as you read this, wondering at the fact that the show is still on. Your surprise would be, in a sense, warranted. Survivor is about to embark on its 32nd season (that is, though the castaways have long been back from their island adventure, the results of said adventure will appear on television, starting tonight). What is it about Survivor that has allowed it to endure for over 15 years? Part of it certainly has to do with the numerous twists producers have thrown into the franchise over the seasons. In order for a concept to resist becoming tired and “unoriginal,” it needs to be supplanted with new ideas so that the thing as a whole feels new. Survivor has maintained this constant revitalization process with impressive success. For example, last season brought back twenty former players (voted on by viewers) for a “second chance,” something that had never been done before. Hidden immunity idols and cast divisions based on specific personality traits (this upcoming season will, for the second time, split players up based on whether they possess “brain,” “beauty,” or “brawn”) have breathed new life into what otherwise might become a familiar formula. Why am I wary about reading the news? The crux of this issue is the overwhelming focus on entertainment in our current age. This is something I discussed in my review of Neil Postman’s brilliant book “Amusing Ourselves to Death.” With the advent of the television and more recently, digital media, the image reigns supreme, and along with this shift from word to image comes the overabundance of visual stimuli. When we are constantly flooded by images, there is no longer the same focus on logic and permanence implied in the written word. Instead, with the image, transience is key. The image is not designed to last. But it is certainly designed to distract. And it is absolutely designed to amuse. Let’s play the word association game with Thomas Hardy! If anything comes springing to mind, it is most likely his classic novel, Tess of the D’Urbervilles, his most widely known work. Tess of the D’Urbervilles is certainly an excellent novel- in fact, I adore this novel and will probably write a review of it at some point in the future. Yet, interestingly, Hardy’s primary passion was not for the novelistic form but for poetry. Indeed, Hardy desired to be a poet and saw himself as a poet first and foremost. He set about writing novels to support himself financially, and then focused on poetry when he was better off. Today Thomas Hardy is mainly remembered for his novels. This recognition is well-deserved, since, as I mentioned above, Hardy is a master craftsman when it comes to the novel. However, he is also a master poet, one of the best of the Victorian era, and it is his poetry that I want to recommend in this post, specifically the poem, “The Convergence of the Twain.” This poem, which you can read here, is about the ill-fated Titanic. There is certainly no shortage of adaptations of the Sherlock Holmes saga. But, in my mind, few have been as successful as BBC’s Sherlock, which stars Benedict Cumberbatch and Martin Freeman. Three seasons in to this excellent show (with two more written and, albeit slowly, on the way), it is not lacking in popularity. It probably does not need my recommendation, yet I will give it freely anyways, for what it’s worth. In a culture where the trend leans toward the transient, to television series and movies designed to be consumed in vast proportions and then promptly forgotten, Sherlock stands out. One of my favourite bands is the indie rock group, The National. This week (as well as most weeks) I’ll be listening to them, and I think their music is of the kind that you can keep listening and continually discovering new depth and richness to it. 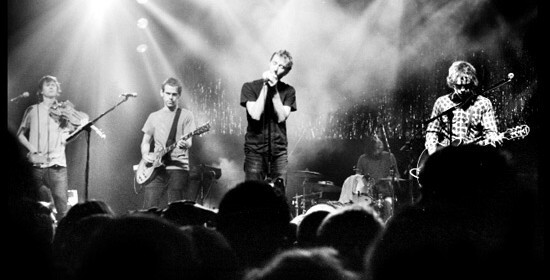 Their songs are polished and perfectly sculpted, and what stands out above all is the uniquely deep voice of lead singer, Matt Berninger (you’ll know what I mean if you listen).